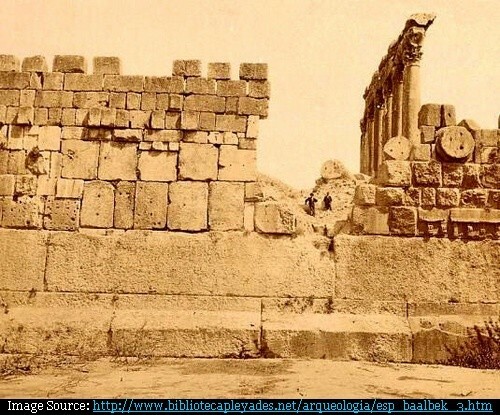 The town of Baalbek in Lebanon is famous for huge sized temple ruins of the Roman period, when Baalbek was known as Heliopolis. 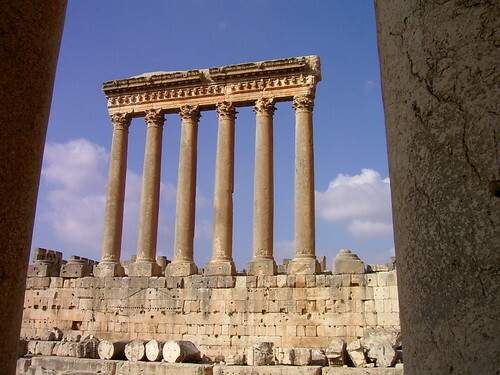 Amongst these ruins are the ruins of the famous Temple of Jupiter Baal ("Heliopolitan Zeus"). Built in first century AD this temple was at that time the largest temple in the Roman Empire measuring 290 feet (~88.4 metres) by 160 feet (~48.8 metres) wide. 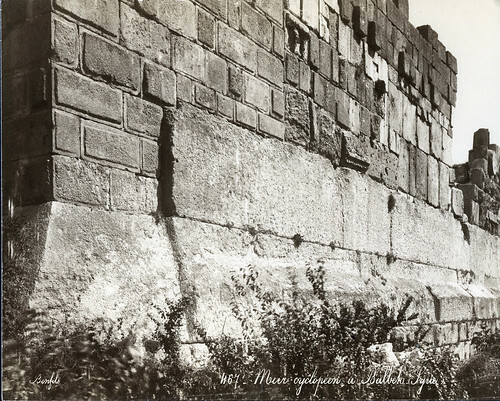 As impressive as the temple is, one of the most unique aspects of the temple complex are three gigantic stone blocks called the "Trilithon" located at the foundation of temple's rear side ruins. These three stone blocks are the Largest Stones used in a building anywhere in the world and weigh around 800 tons (~ 730,000 kg) each. In comparison the fully laden weight of a Boeing 747 is only 439,985 kg. 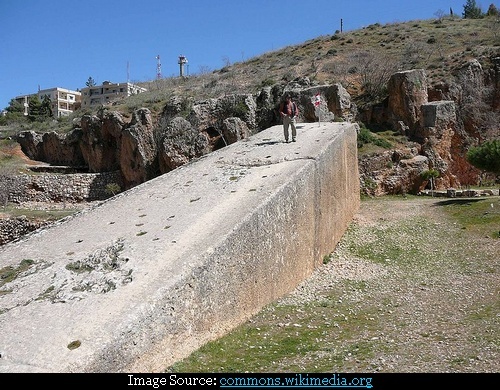 Each one of these stone is 70 feet long, 14 feet high, 10 feet thick (21.33 x 4.3 x 3.04 metres). It is beyond comprehension how these massive stones were moved from the nearby query, raised up on the mound and placed at the present location. Even the Archaeologists/Historians are not sure about the methods employed by the master builders of that time, to move such gigantic stones. The necessity of using such large and heavy stones for building purposes, when smaller, easily transportable stones could have been used, also remains unexplained. However this is not the end of story of these amazing stones. 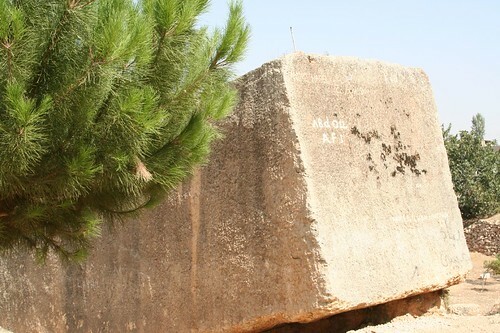 A fourth and still larger stone called Hajar el Gouble (meaning: The Stone of the South) aka Hajar el Hibla (meaning: The Stone of the Pregnant Woman - This unusual name is due to local belief that touching the stone helps women to conceive) lies unused in a nearby quarry about 1.6 km from the town. Its weight, is estimated at 1,069 tons (~970,000 kg). 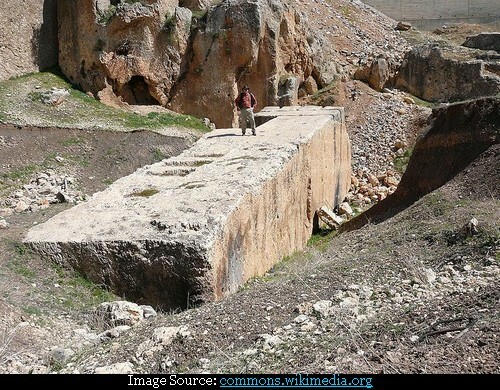 To top it all, there is even larger but unfinished stone, weighing approximately 1,322 tons (~ 1.2 million kg), which lies in the second quarry across the road.